Here on the Upper Elementary Snapshots blog, we're always working hard to bring you the best teaching ideas and resources for upper elementary! 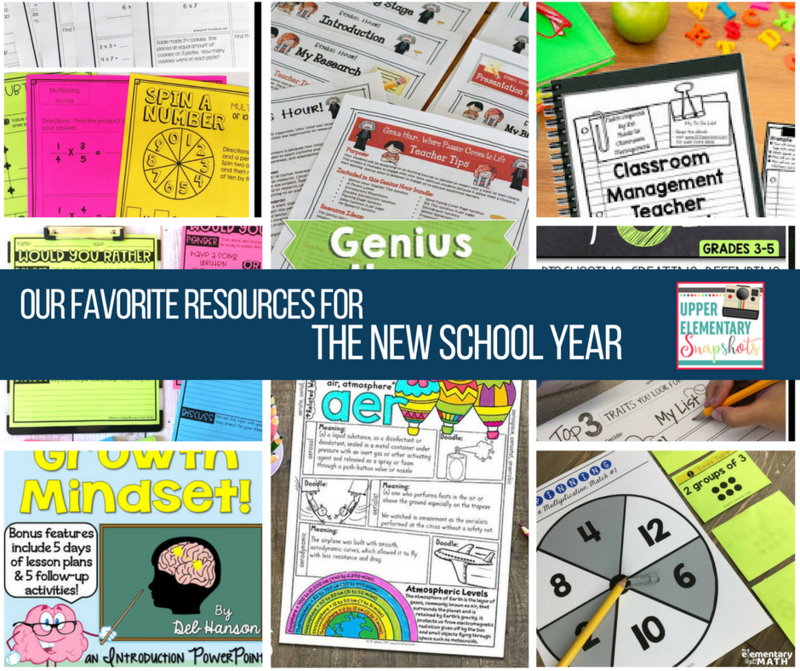 This post is all about our most highly-rated resources for the school year. Read more about us here, and then check out our recommended resources below! When you're starting a new school year, classroom management is always on your mind! We have some wonderful resources to help your students grow into hard workers this year! A poorly managed classroom results in avoidable behavior problems, decreased motivation, general feelings of stress and uneasiness and lost time on task. Investing the time to sharpen your classroom management skills, implement strategies and tools to streamline management tasks and developing routines and strategies to ensure your classroom "runs itself" will be greatly rewarded in countless ways. The CLASSROOM MANAGEMENT BUNDLE is jam-packed with ideas, tools and resources to make you a highly-effective teacher! I like to start the year with discussions about the importance of having a growth mindset because it sets a positive tone for the new school year. I also like to be able to quickly refer back to growth mindset concepts at various points during the school year, like when we begin a new unit that is particularly challenging. 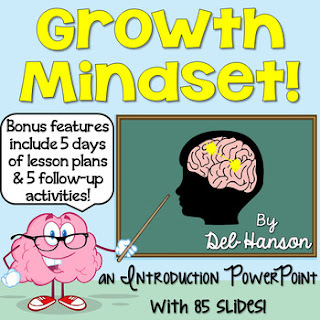 This 85-slide PowerPoint is designed to introduce your students to 5 major components of growth mindset beliefs. 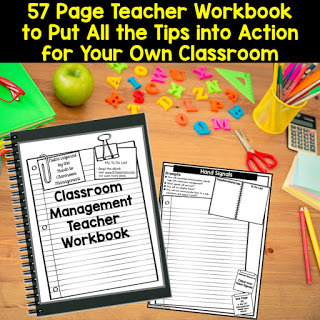 Along with the PowerPoint, it contains lesson plans for 5 days, directions on how to split the PowerPoint into 5 lessons, PowerPoint companions, and 5 worksheets your students can complete each day after going through the PowerPoint slides. Customize the perfect agenda for your students this school year! 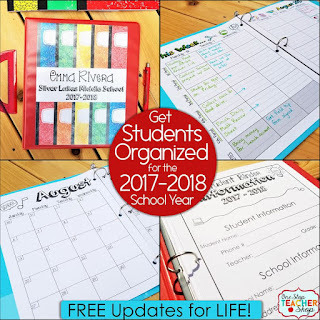 The One Stop Student Binder will teach students the important skill of staying organized all year long. Includes weekly agendas, calendars, schedules, progress sheets, data tracking and more. With this purchase, you will get FREE updates for LIFE!!! This student binder is currently dated through July 2018. As I update this product each year, or anytime in between, you will be notified, and be able to get all the updates for FREE! That means that this student binder can be used from year-to-year without ever purchasing a new one! Looking for help turning your students into quality readers and writers this year? 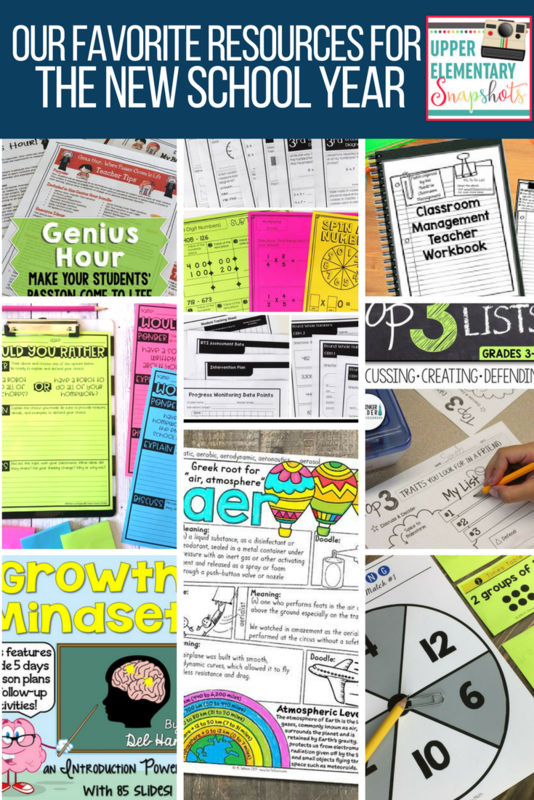 We have ELA resources that are engaging and easy to implement! 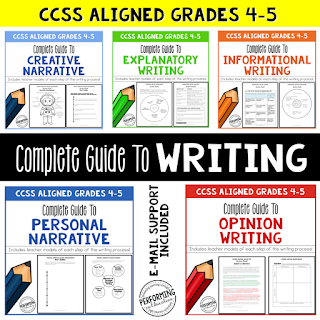 The Complete Guide to Writing is a resource that engages students in fun, meaningful writing prompts while teaching them the organization of these 5 types of writing. Teach Opinion, Informational, Explanatory, Personal Narrative, and Creative Narrative writing like a pro with this resource! 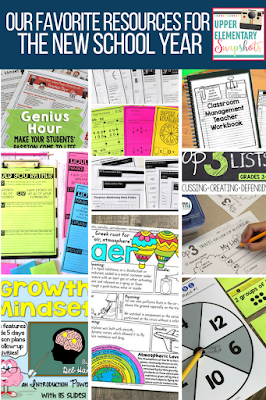 Each unit includes teacher examples and all printable student organizers. Print out the pages you need, and you're all set to teach your students how to write incredible, well organized essays! This is great for 4th & 5th grade teachers that want to easily teach their students the writing process without having to spend hours planning each week. It seems like every conversation I overhear my students having starts with, “Would you rather...”! I remember having the same conversations with my friends when I was in school! So, why not use conversations that students are already having and apply them to critical thinking, opinion writing, and collaborative discussions! 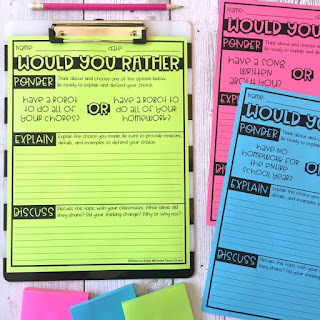 This resource includes 16 Would You Rather prompts and comes in two formats: DIGITAL and PRINTABLE! Editable versions of each are also included! These activities can be used in a variety of ways. They are a perfect way to get students interacting and getting to know each other. Students ponder each option, then write about and defend their choices. Next, students discuss their choices and reasoning, and write a final reflection. Students can discuss in pairs, small groups, or as a whole-class! Starting the year with writing and continuing throughout the year is so important for our students. 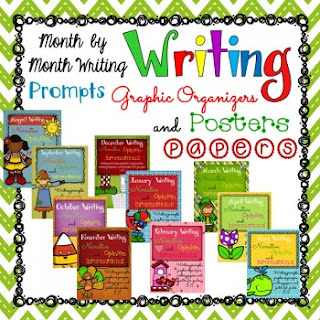 With this Month by Month Writing Prompts, Posters, and Graphic Organizers Bundle you are certain to keep your students motivated to write the entire year! Your students will enjoy the fun writing prompts inspired by unusual and offbeat holidays as well as traditional holidays. For each writing prompt there is a graphic organizer that can help your students learn how to plan and organize their writing. 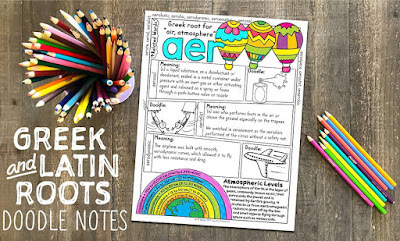 Colorful writing posters can be used to decorate your bulletin boards, walls, and writing prompt cards for each prompt will fit perfectly in any writing center. 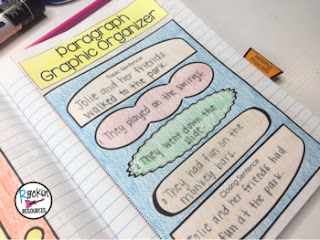 This Step-By-Step SENTENCE STRUCTURE AND PARAGRAPH WRITING UNIT unit is loaded with teaching tools to give your students the foundation they need for sentence structure and how to form a strong paragraph! It is Common Core aligned with the CCSS listed on each anchor chart. You will find 116 pages in the teacher resource (including cover sheets and answer keys) and 67 pages in the student resource. 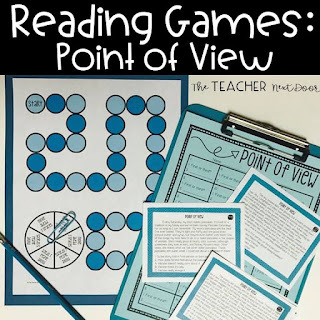 These 20 Reading Games for 4th/5th graders target key reading skills and are perfect for centers, for whole class, or for test prep. There are 10 Fiction Games and 10 Nonfiction Reading Games, which are engaging for students but very low prep, and easy to manage for the busy teacher. Doodle notes present your students with a meaningful and engaging activity that they will love. Doodle notetaking activates verbal and visual modalities to capture concepts. The whole brain is absorbed in hearing, synthesizing, and retaining ideas. This high level of engagement not only helps with retention of the content, but it also leaves little room for distraction. It's difficult to incorporate 21st century competencies into your already jam-packed lessons! Check out our recommendations for incorporating creativity and innovation in the classroom. Genius Hour is a time set aside during the school day for students to research something they are passionate about. By implementing this during the first month of school, your students become more engaged in learning and are excited to come to school each day to work on their projects. 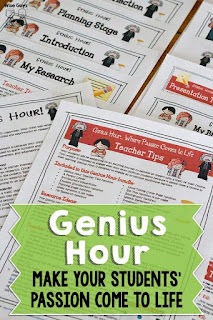 Give Genius Hour a try in your classrooms and watch student learning explode! 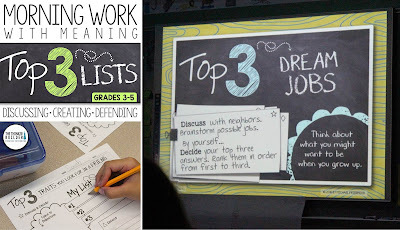 Put some meaningful morning work into your daily routine with these "Top 3 List" activities! Get students discussing engaging topics, creating lists, defending their choices, and analyzing their own and others' decisions, all in a clever format with little prep on your part. It's a great way to warm-up students' brains and get the morning started in a fun yet purposeful way. Geometrocity is a project based learning activity where students will take their geometry skills and design their own city. This multi-tiered activity allows for immediate differentiation because of the size, and students may complete parts or the entire project based on your choosing. This project doesn’t just focus on math skills, as there are components of social studies (mapping skills), writing, problem solving and comprehension skills too. Students will be creating a city that uses 2D and 3D, practicing both plane and solid geometry. 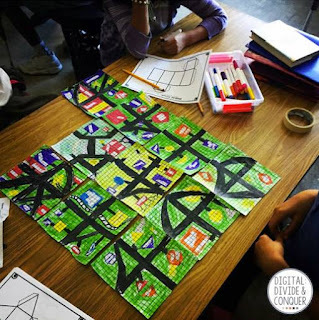 This project allows for students to practice and apply learned skills in geometry while problem solving and making decisions based on their own knowledge, creativity, and imagination. Students will utilize many types of geometric concepts such as nets to create buildings and structures, designing parts of a city with shapes, lines, angles, and incorporating multiple skills at the same time to reach their objectives. Teaching math concepts in the upper grades can be a real challenge! 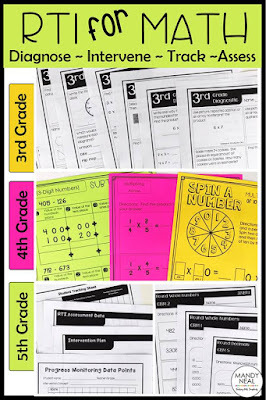 These resources will help you get your students excited about learning math! Fact fluency is so important because it frees our students up to better understand other math concepts like division. Many kids come to the upper grades without knowing their basic facts and what better way to have them practice but through games and educational play. This bundle is great because each pack contains the same 3 games for each fact. Once kids know how to play them, they can practice with any of the facts. Start the school year right, practicing multiplication facts. Have you ever been told that you need to be implementing RTI for math? Do you know where to start? This is the reason I created the Standards based progress monitoring. Providing evidence of students learning is crucial. Progress monitoring will allow you to document student growth and make sure that the interventions that you administer are working. Everything you need to assess and track students is provided here. Each of the Common Core Standards contain A LOT of little pieces. I broke these down into the pieces that my students needed to master in order to master the entire standard. This resource is available for 3rd, 4th, and 5th grade! 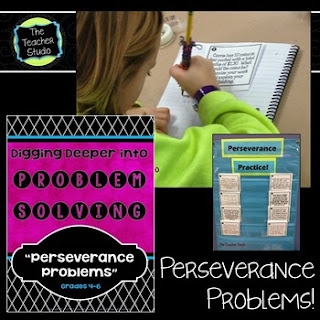 Helping students realize that not all work comes easily is so important--so this collection of problems is geared toward helping them realize that struggling is ok, and working together can lead to new understanding, even when the answer isn't immediately evident. What do you get? I start this unit with a number of lesson ideas and suggestions for how to get your students more engaged and self-reliant with their problem solving. I include photos from my classroom, learning posters that can be turned into anchor charts, rubrics, checklists, and more. But what is really the heart of the unit is the 24 high level problems that will really test your students' ability to apply these new problem solving skills. Some of the problems have many solutions. Others are tricky to read and interpret. Others require them to simply "dig in" and start guessing and checking! 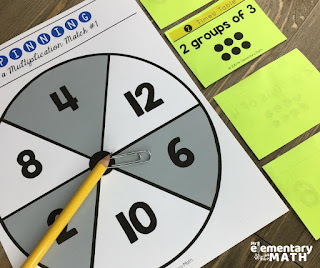 These math sorts are engaging activities that encourage math talk and are great for centers. Students explain how they sort their cards and build strong math concepts as they create cards of their own. Please view preview for more information and 7 FREE sorts. - 80 sorts that review third grade math standards. 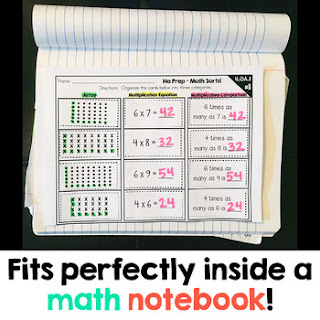 - Dividers for Notebook - Students use these dividers to keep track of when they complete each math sort. The learning goals are also on each divider.